January 3, 1945 – The Chicago Daily Tribune, noting the renewed effort of Chicago Mayor Edward Kelly to save the Auditorium Theatre, editorializes in favor of the effort. “Its proportions are noble,” the paper writes. “Its acoustics are incomparably good. Its loss would mean the loss to Chicago and the world of an authentic masterpiece of architecture. [Chicago Daily Tribune, January 3, 1945] Opened in 1889 as a combination hotel, office building and performance space, back taxes threatened the complex although it was believed sale of the hotel and office building could at least pay off the debt. The theater itself had no hope of doing that. The Tribune gets behind a plan to have a not-for-profit entity assume control over the theater, giving it “the same kind of tax exemption that goes to the Art Institute, and the various universities and museums.” In 1946 Roosevelt University stepped up and assumed responsibility for the building. The theater would remain shuttered for nearly two decades, though, until in 1963 Mrs. Beatrice Spachner founded the Auditorium Theatre Council which raised three million dollars to renovate the structure. 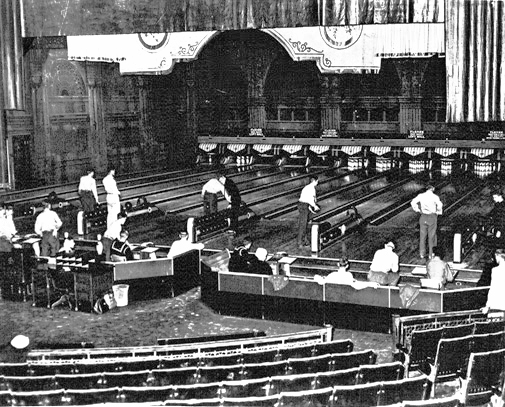 Under the direction of architect Harry Weese, the gem on Congress opened on October 31, 1967 with the New York City Ballet’s production of “A Midsummer Night’s Dream.” The above photo shows the Auditorium in 1945, with its front rows and stage converted into a bowling alley as part of a Servicemen’s Center that provided a welcoming place for over 2.2 million servicemen during the war years. January 3, 1928 -- Samuel Insull comes closer to his dream of helping the city build a new home for the Chicago Civic Opera, completing a transaction that gives him control of an entire block of the Loop, bounded by Madison Street on the south, the river on the west, Wacker Drive (Market Street at the time) on the east and Washington Boulevard on the north. On this date the purchase of the southeast corner of the property, the piece necessary to complete the plan, is filed with the recorder of deeds. Plans are to create an opera house that has about the same amount of space as the 1889 Auditorium Theater’s performance space with a modern office tower rising above it. The Chicago Daily Tribune reports, “Plans for the building are being somewhat hampered … because of the difficulty of harmonizing the office building and the opera house into one beautiful building. However, Architect Ernest R. Graham said he is confident of planning a structure at once sightly and with profitable renting space.” Just 22 months later the new Civic Opera Building would open with Rosa Raisa playing the title role in Aida. For more information on opening night, please follow this link. 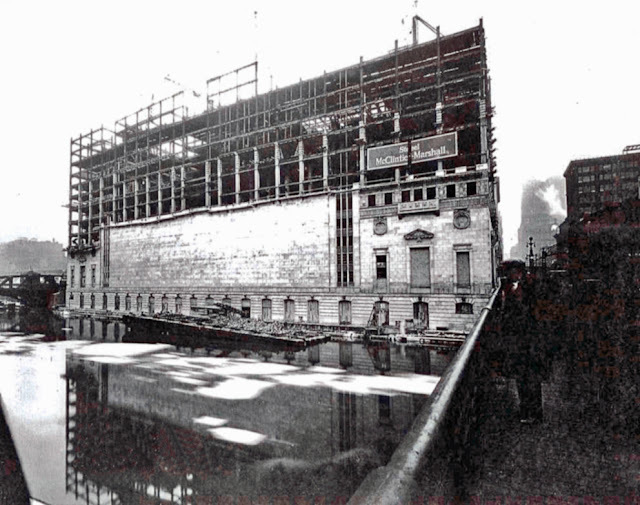 The above photo shows the Civic Opera Building rising quickly in February of 1929.